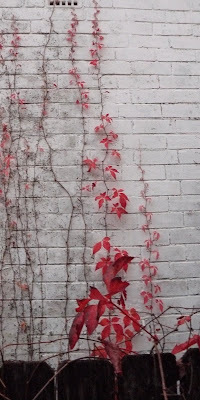 Each year the Boston Ivy on my neighbour's house puts up a wonderful autumn display. This year it has been a particularly wonderful colour - blood orange springs to mind. Sadly she doesn't get to see it - but is is right outside my kitchen window so I do. It really is a weed and climbs up her house and over out adjoining fence. I am ever hopeful to do something in my garden but time never seems to permit it . So, I am thankful that she lets this bit run wild. Ivy also runs rampant over the back steps - this has just been cut back to permit safe journeys to the laundry and back yard. The camilia is still flowering and the tree fern just does what tree fersn do - look stately and green. It is best this time of year as it is a bit exposed in summer and suffers from the heat and sunburn.